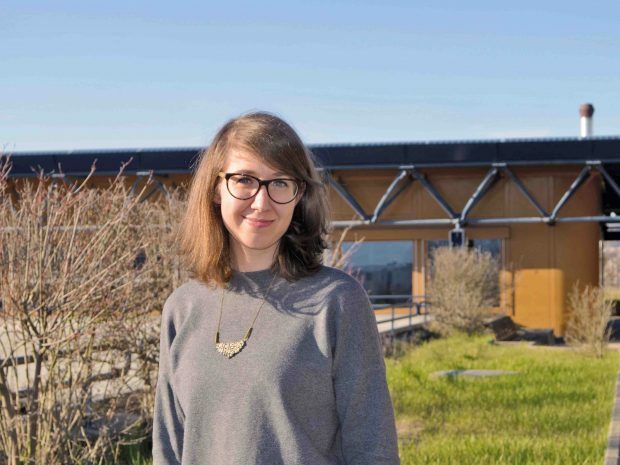 Virginie Uhlmann is joining EMBL-EBI as a Research Group Leader in September 2018. Her research focuses on bioimage informatics – making sense of bioimaging using mathematical tools and computer vision algorithms. Virginie’s group works on collaborative interdisciplinary projects that sit at the intersection of biology, computer science and mathematics. Image analysis for biology enables us to extract quantitative information from what you’re looking at, in a reproducible and efficient way. Digital images are made of pixels and computers can help us to make sense of the information these pixels hold. Understanding the ‘pixel content’ of an image is not the end of the story, though. A bioimage is a reflection of the real world, which, of course, is not made of pixels. You therefore need tools that allow characterisation of what is in the image beyond the pixel representation. Maths is perfectly suited for this. It allows building continuous models that can use pixel information but remain faithful to what the image is really showing. I’ve loved biology ever since I was little. Unfortunately, I realised relatively early in school that I didn’t enjoy being in a lab – so I switched to studying Applied Maths. I never gave up my dream of working in biology, but I chose to focus more on how to use maths and computers to better understand the field. Bioimage analysis was therefore a great match: it is crucial for research in biology and involves a good mix of mathematics and computer science. Always keep sight of the bigger picture. We’re all working on our very specific research projects, but we should always remember how they fit into the work of the lab, the institute, the field and even the wider world of science. The way I see it, all scientists are working together to help understand our world. What kind of people are you recruiting? Right now, I’m hoping to find enthusiastic PhD students and postdocs that are as excited as I am about working at the intersection of biology, computer science and mathematics. I suspect PhD students who may want to work with us would probably have a biology background and an interest in maths and programming, while postdocs might have more of a maths or computational science focus, but I think we can be pretty flexible at this stage. What advice would you give someone who wants to join your group? Be clear about why you are interested in doing this type of interdisciplinary work. It’s not an easy career path, so ambition and a strong motivation are key! In French, it’s “toujours te trouver là où tu veux être” – always be where you really want to be; follow your gut feeling. One of my professors told me this in the third year of my Undergraduate degree, when I was faced with a tough decision. I like structure and I like planning things, but this advice really brought me back to spontaneity. Maths and analytical reasoning can give you a lot of scientific answers, but in life, you should always trust your gut instinct. Time is precious. There are so many things I want to try; I don’t want to waste even a minute! I would like our research to inspire people from biology, maths and computer science to start merging the three fields more. In the future, I’d love to see academic courses focused on things like “fundamental maths for biology”. I’d like to know to what extent randomness is actually random. It’s an important question for biology, but it’s also a much bigger philosophical question. Life is just too interesting and there’s not enough spare time! I read a lot. I especially love literature because it makes the world beautiful. Romain Gary is an all-time favourite of mine. He’s the only author who won the Prix Goncourt under two different names – his real name and the pen name “Émile Ajar”. I imagine Romain got a real kick out of keeping his connection to Émile Ajar a secret until after his death, when he revealed the whole thing in a posthumous book. Romain Gary is a master of words. Reading his work, I always think he conveys the things I think and feel in a much more elegant way than I ever can. On a different note, I love bouldering and rope climbing – probably to compensate for all the time I spend at my desk or reading. Like many climbers, I’m slightly afraid of heights, but that’s where the challenge comes from. It’s a mental and a physical challenge: it helps me create a strong mind-and-body connection, and it’s extremely rewarding. Name one tool you can’t live without. Pen and paper; I have an almost emotional relationship with them. I link computers, tablets, and gadgets in general to productivity and efficiency, but pen and paper are what I use when I want to be creative.